This article is about the mineral or gem. For other uses, see Ruby (disambiguation). A ruby is a pink to blood-red colored gemstone, a variety of the mineral corundum (aluminium oxide). Other varieties of gem-quality corundum are called sapphires. Ruby is one of the traditional cardinal gems, together with amethyst, sapphire, emerald, and diamond. The word ruby comes from ruber, Latin for red. The color of a ruby is due to the element chromium. Some gemstones that are popularly or historically called rubies, such as the Black Prince's Ruby in the British Imperial State Crown, are actually spinels. These were once known as "Balas rubies". The quality of a ruby is determined by its color, cut, and clarity, which, along with carat weight, affect its value. The brightest and most valuable shade of red called blood-red or pigeon blood, commands a large premium over other rubies of similar quality. After color follows clarity: similar to diamonds, a clear stone will command a premium, but a ruby without any needle-like rutile inclusions may indicate that the stone has been treated. Ruby is the traditional birthstone for July and is usually pinker than garnet, although some rhodolite garnets have a similar pinkish hue to most rubies. The world's most valuable ruby is the Sunrise Ruby. Rubies have a hardness of 9.0 on the Mohs scale of mineral hardness. Among the natural gems only moissanite and diamond are harder, with diamond having a Mohs hardness of 10.0 and moissanite falling somewhere in between corundum (ruby) and diamond in hardness. Sapphire, ruby, and pure corundum are α-alumina, the most stable form of Al2O3, in which 3 electrons leave each aluminum ion to join the regular octahedral group of six nearby O2− ions; in pure corundum this leaves all of the aluminum ions with a very stable configuration of no unpaired electrons or unfilled energy levels, and the crystal is perfectly colorless. When a chromium atom replaces an occasional aluminum atom, it too loses 3 electrons to become a chromium3+ ion to maintain the charge balance of the Al2O3 crystal. However, the Cr3+ ions are larger and have electron orbitals in different directions than aluminum. The octahedral arrangement of the O2− ions is distorted, and the energy levels of the different orbitals of those Cr3+ ions are slightly altered because of the directions to the O2− ions. Those energy differences correspond to absorption in the ultraviolet, violet, and yellow-green regions of the spectrum. Transmittance of ruby in optical and near-IR spectra. Note the two broad violet and yellow-green absorption bands and one narrow absorption band at the wavelength of 694 nm, which is the wavelength of the ruby laser. If one percent of the aluminum ions are replaced by chromium in ruby, the yellow-green absorption results in a red color for the gem. Additionally, absorption at any of the above wavelengths stimulates fluorescent emission of 694-nanometer-wavelength red light, which adds to its red color and perceived luster. After absorbing short-wavelength light, there is a short interval of time when the crystal lattice of ruby is in an excited state before fluorescence occurs. If 694-nanometer photons pass through the crystal during that time, they can stimulate more fluorescent photons to be emitted in-phase with them, thus strengthening the intensity of that red light. By arranging mirrors or other means to pass emitted light repeatedly through the crystal, a ruby laser in this way produces a very high intensity of coherent red light. All natural rubies have imperfections in them, including color impurities and inclusions of rutile needles known as "silk". Gemologists use these needle inclusions found in natural rubies to distinguish them from synthetics, simulants, or substitutes. Usually, the rough stone is heated before cutting. These days, almost all rubies are treated in some form, with heat treatment being the most common practice. Untreated rubies of high quality command a large premium. Some rubies show a three-point or six-point asterism or "star". These rubies are cut into cabochons to display the effect properly. Asterisms are best visible with a single-light source and move across the stone as the light moves or the stone is rotated. Such effects occur when light is reflected off the "silk" (the structurally oriented rutile needle inclusions) in a certain way. This is one example where inclusions increase the value of a gemstone. Furthermore, rubies can show color changes—though this occurs very rarely—as well as chatoyancy or the "cat's eye" effect. Generally, gemstone-quality corundum in all shades of red, including pink, are called rubies. However, in the United States, a minimum color saturation must be met to be called a ruby; otherwise, the stone will be called a pink sapphire. Drawing a distinction between rubies and pink sapphires is relatively new, having arisen sometime in the 20th century. Often, the distinction between ruby and pink sapphire is not clear and can be debated. As a result of the difficulty and subjectiveness of such distinctions, trade organizations such as the International Colored Gemstone Association (ICGA) have adopted the broader definition for ruby which encompasses its lighter shades, including pink. The Mogok Valley in Upper Myanmar (Burma) was for centuries the world's main source for rubies. That region has produced some exceptional rubies, however in recent years few good rubies have been found. In central Myanmar, the area of Mong Hsu began producing rubies during the 1990s and rapidly became the world's main ruby mining area. The most recently found ruby deposit in Myanmar is in Namya (Namyazeik) located in the northern state of Kachin. Historically, rubies have also been mined in Thailand, in the Pailin and Samlout District of Cambodia, as well as in Afghanistan, Australia, Brazil, Colombia, India, Namibia, Japan, and Scotland; after the Second World War ruby deposits were found in Madagascar, Nepal, Pakistan, Tajikistan, Tanzania, and Vietnam. In Sri Lanka, lighter shades of rubies (often "pink sapphires") are more commonly found. The Republic of Macedonia is the only country in mainland Europe to have naturally occurring rubies. 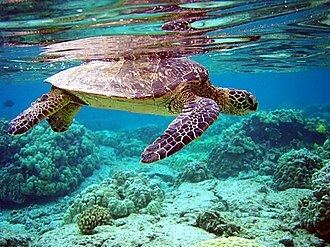 They can mainly be found around the city of Prilep. Macedonian rubies have a unique raspberry color. The ruby is also included on the Macedonian coat of arms. A few rubies have been found in the U.S. states of Montana, North Carolina, South Carolina and Wyoming. Spinel, another red gemstone, is sometimes found along with rubies in the same gem gravel or marble. Red spinels may be mistaken for rubies by those lacking experience with gems. However, the finest red spinels can have values approaching that of an average ruby. Rubies, as with other gemstones, are graded using criteria known as the four Cs, namely color, cut, clarity and carat weight. Rubies are also evaluated on the basis of their geographic origin. Color: In the evaluation of colored gemstones, color is the most important factor. Color divides into three components: hue, saturation and tone. Hue refers to color as we normally use the term. Transparent gemstones occur in the pure spectral hues of red, orange, yellow, green, blue, violet. In nature, there are rarely pure hues, so when speaking of the hue of a gemstone, we speak of primary and secondary and sometimes tertiary hues. Ruby is defined to be red. All other hues of the gem species corundum are called sapphire. Ruby may exhibit a range of secondary hues, including orange, purple, violet, and pink. Improving the quality of gemstones by treating them is common practice. Some treatments are used in almost all cases and are therefore considered acceptable. During the late 1990s, a large supply of low-cost materials caused a sudden surge in supply of heat-treated rubies, leading to a downward pressure on ruby prices. Improvements used include color alteration, improving transparency by dissolving rutile inclusions, healing of fractures (cracks) or even completely filling them. The most common treatment is the application of heat. Most rubies at the lower end of the market are heat treated to improve color, remove purple tinge, blue patches, and silk. These heat treatments typically occur around temperatures of 1800 °C (3300 °F). Some rubies undergo a process of low tube heat, when the stone is heated over charcoal of a temperature of about 1300 °C (2400 °F) for 20 to 30 minutes. The silk is partially broken, and the color is improved. The first heating process during which no fillers are added. The heating process eradicates impurities inside the fractures. Although this can be done at temperatures up to 1400 °C (2500 °F) it most likely occurs at a temperature of around 900 °C (1600 °F) since the rutile silk is still intact. The second heating process in an electrical oven with different chemical additives. Different solutions and mixes have shown to be successful, however mostly lead-containing glass-powder is used at present. The ruby is dipped into oils, then covered with powder, embedded on a tile and placed in the oven where it is heated at around 900 °C (1600 °F) for one hour in an oxidizing atmosphere. The orange colored powder transforms upon heating into a transparent to yellow-colored paste, which fills all fractures. After cooling the color of the paste is fully transparent and dramatically improves the overall transparency of the ruby. If a color needs to be added, the glass powder can be "enhanced" with copper or other metal oxides as well as elements such as sodium, calcium, potassium etc. The second heating process can be repeated three to four times, even applying different mixtures. When jewelry containing rubies is heated (for repairs) it should not be coated with boracic acid or any other substance, as this can etch the surface; it does not have to be "protected" like a diamond. The treatment can identified by noting bubbles in cavities and fractures using a 10x loupe. In 1837, Gaudin made the first synthetic rubies by fusing potash alum at a high temperature with a little chromium as a pigment. In 1847, Ebelmen made white sapphire by fusing alumina in boric acid. In 1877, Frenic and Freil made crystal corundum from which small stones could be cut. Frimy and Auguste Verneuil manufactured artificial ruby by fusing BaF2 and Al2O3 with a little chromium at red heat. In 1903, Verneuil announced he could produce synthetic rubies on a commercial scale using this flame fusion process. By 1910, Verneuil's laboratory had expanded into a 30 furnace production facility, with annual gemstone production having reached 1,000 kilograms (2,000 lb) in 1907. Other processes in which synthetic rubies can be produced are through Czochralski's pulling process, flux process, and the hydrothermal process. Most synthetic rubies originate from flame fusion, due to the low costs involved. Synthetic rubies may have no imperfections visible to the naked eye but magnification may reveal curves, striae and gas bubbles. The fewer the number and the less obvious the imperfections, the more valuable the ruby is; unless there are no imperfections (i.e., a perfect ruby), in which case it will be suspected of being artificial. Dopants are added to some manufactured rubies so they can be identified as synthetic, but most need gemological testing to determine their origin. Synthetic rubies have technological uses as well as gemological ones. 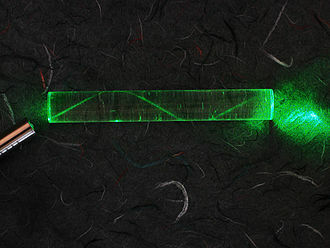 Rods of synthetic ruby are used to make ruby lasers and masers. The first working laser was made by Theodore H. Maiman in 1960. Maiman used a solid-state light-pumped synthetic ruby to produce red laser light at a wavelength of 694 nanometers (nm). Ruby lasers are still in use. Rubies are also used in applications where high hardness is required such as at wear exposed locations in modern mechanical clockworks, or as scanning probe tips in a coordinate measuring machine. Imitation rubies are also marketed. Red spinels, red garnets, and colored glass have been falsely claimed to be rubies. Imitations go back to Roman times and already in the 17th century techniques were developed to color foil red—by burning scarlet wool in the bottom part of the furnace—which was then placed under the imitation stone. Trade terms such as balas ruby for red spinel and rubellite for red tourmaline can mislead unsuspecting buyers. Such terms are therefore discouraged from use by many gemological associations such as the Laboratory Manual Harmonisation Committee (LMHC). The Smithsonian's National Museum of Natural History in Washington, D.C. has some of the world's largest and finest ruby gemstones. The 23.1 carats (4.62 g) Burmese ruby, set in a platinum ring with diamonds, was donated by businessman and philanthropist Peter Buck in memory of his late wife Carmen Lúcia. This gemstone displays a richly saturated red color combined with an exceptional transparency. The finely proportioned cut provides vivid red reflections. The stone was mined from the Mogok region of Burma (now Myanmar) in the 1930s. In 2007 the London jeweler Garrard & Co featured on their website a heart-shaped 40.63-carat ruby. On December 13/14, 2011 Elizabeth Taylor's complete jewellery collection was auctioned by Christie's. Several ruby-set pieces were included in the sale, notably a ring set with an 8.24 ct gem that broke the 'price-per-carat' record for rubies ($512,925 per carat, i.e. over $4.2 million in total), and a necklace that sold for over $3.7 million. The Liberty Bell Ruby is the largest mined ruby in the world. It was stolen in a heist in 2011. The Sunrise Ruby is the world's most expensive ruby, most expensive coloured gemstone, and most expensive gemstone other than a diamond. In May 2015, it sold at auction in Switzerland to an anonymous buyer for US$30 million. A synthetic ruby crystal became the gain medium in the world's first optical laser, conceived, designed and constructed by Theodore H. "Ted" Maiman, on the 16th of May, 1961 at Hughes Research Laboratories. 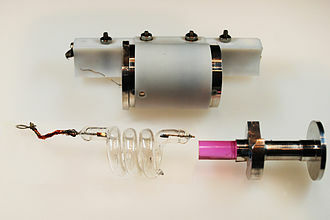 The concept of electromagnetic radiation amplification through the mechanism of stimulated emission had already been successfully demonstrated in the laboratory by way of the Maser, using other materials such as ammonia and, later, ruby, but the Ruby Laser was the first device to work at optical (694.3 nm) wavelengths. Maiman's prototype laser is still in working order. An early recorded transport and trading of rubies arises in the literature on the North Silk Road of China, wherein about 200 BC rubies were carried along this ancient trackway moving westward from China. Rubies have always been held in high esteem in Asian countries. They were used to ornament armor, scabbards, and harnesses of noblemen in India and China. Rubies were laid beneath the foundation of buildings to secure good fortune to the structure. ^ Free to use images of molecular models made by Miramodus ltd.
^ a b "Ruby: causes of color". Archived from the original on March 21, 2016. Retrieved March 28, 2016. ^ a b Matlins, Antoinette Leonard (2010). Colored Gemstones. Gemstone Press. p. 203. ISBN 0-943763-72-X. Archived from the original on May 2, 2016. ^ Reed, Peter (1991). Gemmology. Butterworth-Heinemann. p. 337. ISBN 0-7506-6449-5. Archived from the original on January 2, 2017. ^ Wise, Richard G. "Gemstone Connoisseurship; The Finer Points, Part II". Archived from the original on April 26, 2012. ^ Hughes, Richard W. "Walking the line in ruby & sapphire". ruby-sapphire.com. Archived from the original on January 13, 2012. ^ Federman, David. "Pink Sapphire". Modern Jeweler. Archived from the original on January 31, 2012. ^ "This is the New Coat of Arms of Republic of Macedonia - Independent.mk". Independent.mk. Archived from the original on March 30, 2017. Retrieved March 30, 2017. ^ Wenk, Hans-Rudolf; Bulakh, A. G. (2004). Minerals: their constitution and origin. Cambridge, U.K.: Cambridge University Press. pp. 539–541. ISBN 0-521-52958-1. ^ Wise, Richard W. (2006). Secrets Of The Gem Trade, The Connoisseur's Guide To Precious Gemstones. Brunswick House Press. pp. 18–22. ISBN 0-9728223-8-0. ^ The Heat Treatment of Ruby and Sapphire. Bangkok, Thailand: Gemlab Inc. 1992. ISBN 0940965100. ^ Milisenda, C C (2005). "Rubine mit bleihaltigen Glasern gefullt". Zeitschrift der Deutschen Gemmologischen Gesellschaft (in German). Deutschen Gemmologischen Gesellschaft. 54 (1): 35–41. ^ "Lead Glass-Filled Rubies". GIA Global Dispatch. Gemological Institute of America. 2012. Archived from the original on June 14, 2012. ^ "Bahadur: a Handbook of Precious Stones". 1943. Archived from the original on September 27, 2007. Retrieved August 19, 2007. ^ a b Maiman, T.H. (1960). "Stimulated optical radiation in ruby". Nature. 187 (4736): 493–494. Bibcode:1960Natur.187..493M. doi:10.1038/187493a0. ^ "Thomas Nicols: A Lapidary or History of Gemstones". 1652. Archived from the original on August 19, 2007. Retrieved August 19, 2007. ^ "The Carmen Lúcia Ruby". Exhibitions. Archived from the original on March 9, 2008. Retrieved February 28, 2008. ^ "Garrards – Treasures (large and important jewelry pieces)". Archived from the original on July 29, 2012. Retrieved November 8, 2010. ^ The Legendary Jewels, Evening Sale & Jewelry (Sessions II and III) | Press Release | Christie's Archived January 29, 2012, at the Wayback Machine. Christies.com (2011-12-14). Retrieved on 2012-07-11. ^ Elizabeth Taylor's ruby and diamond necklace Archived March 5, 2016, at the Wayback Machine. News.yahoo.com (2011-09-07). Retrieved on 2012-07-11. ^ "World's most expensive coloured gem sells for $30m". BBC. May 13, 2015. Archived from the original on May 13, 2015. Retrieved May 13, 2015. ^ "Laser inventor Maiman dies; tribute to be held on anniversary of first laser". Laser Focus World. May 9, 2007. Archived from the original on September 27, 2007. Retrieved May 14, 2007. ^ Smith, Henry G. (1896). "Chapter 2, Sapphires, Rubies". Gems and Precious Stones. Charles Potter Government Printer, Australia. Archived from the original on September 29, 2007. Wikimedia Commons has media related to Ruby. Chromium is a chemical element with symbol Cr and atomic number 24. It is the first element in Group 6 and it is a steely-grey, lustrous and brittle metal which takes a high polish, resists tarnishing, and has a high melting point. The name of the element is derived from the Greek word χρῶμα, chrōma, meaning color, Chromium metal is of high value for its high corrosion resistance and hardness. A major development was the discovery that steel could be highly resistant to corrosion and discoloration by adding metallic chromium to form stainless steel. Stainless steel and chrome plating together comprise 85% of the commercial use, trivalent chromium ion is an essential nutrient in trace amounts in humans for insulin and lipid metabolism, although the issue is debated. While chromium metal and Cr ions are not considered toxic, hexavalent chromium is toxic and carcinogenic, abandoned chromium production sites often require environmental cleanup. Chromium is remarkable for its properties, it is the only elemental solid which shows antiferromagnetic ordering at room temperature. Above 38 °C, it changes to paramagnetic, Chromium metal left standing in air is passivated by oxidation, forming a thin, surface layer. This layer is a structure only a few molecules thick. It is very dense, and prevents the diffusion of oxygen into the underlying metal and this is different from the oxide that forms on iron and carbon steel, through which elemental oxygen continues to migrate, reaching the underlying material to cause incessant rusting. Passivation can be enhanced by short contact with oxidizing acids like nitric acid, passivated chromium is stable against acids. Passivation can be removed with a reducing agent that destroys the protective oxide layer on the metal. Chromium metal treated in this way readily dissolves in weak acids, unlike such metals as iron and nickel, does not suffer from hydrogen embrittlement. However, it suffer from nitrogen embrittlement, reacting with nitrogen from air. Chromium is the 22nd most abundant element in Earths crust with a concentration of 100 ppm. Diamond is a metastable allotrope of carbon, where the carbon atoms are arranged in a variation of the face-centered cubic crystal structure called a diamond lattice. Diamond is less stable than graphite, but the rate from diamond to graphite is negligible at standard conditions. Diamond is renowned as a material with superlative physical qualities, most of which originate from the covalent bonding between its atoms. In particular, diamond has the highest hardness and thermal conductivity of any bulk material and those properties determine the major industrial application of diamond in cutting and polishing tools and the scientific applications in diamond knives and diamond anvil cells. Because of its extremely rigid lattice, it can be contaminated by very few types of impurities, such as boron, small amounts of defects or impurities color diamond blue, brown, purple, orange or red. Diamond has relatively high optical dispersion, most natural diamonds are formed at high temperature and pressure at depths of 140 to 190 kilometers in the Earths mantle. Carbon-containing minerals provide the source, and the growth occurs over periods from 1 billion to 3.3 billion years. Diamonds are brought close to the Earths surface through deep volcanic eruptions by magma, Diamonds can be produced synthetically in a HPHT method which approximately simulates the conditions in the Earths mantle. 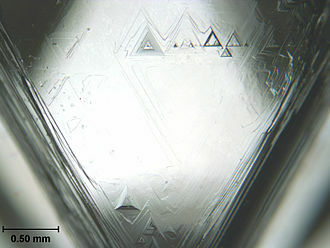 An alternative, and completely different growth technique is chemical vapor deposition, several non-diamond materials, which include cubic zirconia and silicon carbide and are often called diamond simulants, resemble diamond in appearance and many properties. Special gemological techniques have developed to distinguish natural diamonds, synthetic diamonds. The word is from the ancient Greek ἀδάμας – adámas unbreakable, the name diamond is derived from the ancient Greek αδάμας, unalterable, untamed, from ἀ-, un- + δαμάω, I overpower, I tame. Diamonds have been known in India for at least 3,000 years, Diamonds have been treasured as gemstones since their use as religious icons in ancient India. In the field of optics, transparency is the physical property of allowing light to pass through the material without being scattered. On a macroscopic scale, the photons can be said to follow Snells Law, in other words, a translucent medium allows the transport of light while a transparent medium not only allows the transport of light but allows for image formation. The opposite property of translucency is opacity, transparent materials appear clear, with the overall appearance of one color, or any combination leading up to a brilliant spectrum of every color. When light encounters a material, it can interact with it in different ways. These interactions depend on the wavelength of the light and the nature of the material, photons interact with an object by some combination of reflection and transmission. Some materials, such as glass and clean water, transmit much of the light that falls on them and reflect little of it. Many liquids and aqueous solutions are highly transparent, absence of structural defects and molecular structure of most liquids are mostly responsible for excellent optical transmission. Materials which do not transmit light are called opaque, many such substances have a chemical composition which includes what are referred to as absorption centers. Many substances are selective in their absorption of light frequencies. They absorb certain portions of the spectrum while reflecting others. The frequencies of the spectrum which are not absorbed are either reflected or transmitted for our physical observation and this is what gives rise to color. The attenuation of light of all frequencies and wavelengths is due to the mechanisms of absorption. 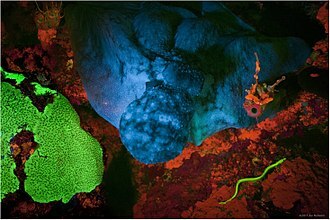 Transparency can provide almost perfect camouflage for animals able to achieve it and this is easier in dimly-lit or turbid seawater than in good illumination. Many marine animals such as jellyfish are highly transparent, at the atomic or molecular level, physical absorption in the infrared portion of the spectrum depends on the frequencies of atomic or molecular vibrations or chemical bonds, and on selection rules. Nitrogen and oxygen are not greenhouse gases because there is no absorption because there is no molecular dipole moment. Lustre or luster is the way light interacts with the surface of a crystal, rock, or mineral. The word traces its origins back to the latin lux, meaning light, a range of terms are used to describe lustre, such as earthy, metallic and silky. Similarly, the term refers to a glassy lustre. A list of terms is given below. Lustre varies over a continuum, and so there are no rigid boundaries between the different types of lustre. The terms are frequently combined to describe types of lustre. Some minerals exhibit unusual optical phenomena, such as asterism or chatoyancy, a list of such phenomena is given below. 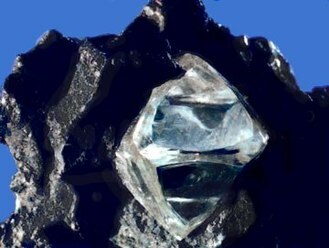 Adamantine minerals possess a superlative lustre, which is most notably seen in diamond, such minerals are transparent or translucent, and have a high refractive index. Minerals with an adamantine lustre are uncommon, with examples being cerussite. Minerals with a degree of lustre are referred to as subadamantine, with some examples being garnet. Dull minerals exhibit little to no lustre, due to coarse granulations which scatter light in all directions, a distinction is sometimes drawn between dull minerals and earthy minerals, with the latter being coarser, and having even less lustre. In mineralogy, an inclusion is any material that is trapped inside a mineral during its formation. In gemology, an inclusion is a characteristic enclosed within a gemstone, according to Huttons law of inclusions, fragments included in a host rock are older than the host rock itself. Inclusions are usually other minerals or rocks, but may be water, liquid or vapor inclusions are known as fluid inclusions. In the case of amber it is possible to find insects and plants as inclusions, the analysis of atmospheric gas bubbles as inclusions in ice cores is an important tool in the study of climate change. A xenolith is a rock which has been picked up by a lava flow. Melt inclusions form when bits of melt become trapped inside crystals as they form in the melt, inclusions are one of the most important factors when it comes to gem valuation. In many gemstones, such as diamonds, inclusions affect the clarity of the gem, in some gems, such as star sapphires, the inclusion actually increases the value of the gem. Tanzania /ˌtænzəˈniːə/, officially the United Republic of Tanzania, is a country in Eastern Africa within the African Great Lakes region. Parts of the country are in Southern Africa, Mount Kilimanjaro, Africas highest mountain, is in northeastern Tanzania. Tanzanias population of 51.82 million is diverse, composed of ethnic, linguistic. Dar es Salaam, the capital, retains most government offices and is the countrys largest city, principal port. 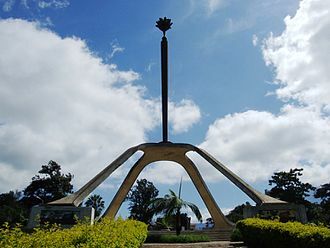 Tanzania is a one party dominant state with the Chama Cha Mapinduzi party in power, from its formation until 1992, it was the only legally permitted party in the country. Elections for president and all National Assembly seats were last held in October 2015, the CCM holds approximately 75% of the seats in the assembly. Prehistoric population migrations include Southern Cushitic speakers, who are ancestral to the Iraqw and Burunge and who moved south from Ethiopia into Tanzania. Based on linguistic evidence, there may have two movements into Tanzania of Eastern Cushitic people at about 4,000 and 2,000 years ago. These movements took place at about the time as the settlement of the iron-making Mashariki Bantu from West Africa in the Lake Victoria. They brought with them the west African planting tradition and the staple of yams. They subsequently migrated out of these regions across the rest of Tanzania, European colonialism began in mainland Tanzania during the late 19th century when Germany formed German East Africa, which gave way to British rule following World War I. The mainland was governed as Tanganyika, with the Zanzibar Archipelago remaining a separate colonial jurisdiction, following their respective independence in 1961 and 1963, the two entities merged in April 1964 to form the United Republic of Tanzania. Tanzania is mountainous and densely forested in the northeast, where Mount Kilimanjaro is located, three of Africas Great Lakes are partly within Tanzania. To the north and west lie Lake Victoria, Africas largest lake, and Lake Tanganyika, the eastern shore is hot and humid, with the Zanzibar Archipelago just offshore. The Imperial State Crown is one of the Crown Jewels of the United Kingdom and symbolises the sovereignty of the monarch. It has existed in various forms since the 15th century, the current version was made in 1937 and is worn by the monarch after a coronation ceremony and during his or her speech at the annual State Opening of Parliament. It contains 2,901 precious stones, including Cullinan II – the second-largest clear cut diamond in the world. St Edwards Crown, used to crown English monarchs, was considered to be a relic, kept in the saints shrine at Westminster Abbey. The Tudor Crown had more pearls and jewels than its predecessor, and the centre petals of each of the fleurs-de-lis had images of Christ. The crown weighed 3.3 kg and was set with 168 pearls,58 rubies,28 diamonds,19 sapphires and 2 emeralds. Following the abolition of the monarchy and the execution of Charles I in 1649, upon the restoration of the monarchy in 1660, a new state crown was made for Charles II by Sir Robert Vyner. About 10 versions of the crown have existed since the restoration, the one made for Queen Victoria in 1838 is the basis for todays crown. At the State Opening of Parliament in 1845, the Duke of Argyll was carrying the crown before Queen Victoria when it fell off the cushion, Victoria wrote in her diary, it was all crushed and squashed like a pudding that had sat down. The gems in the crown were remounted for the coronation of George VI in 1937 by Garrard & Co, the crown was adjusted for Queen Elizabeth IIs coronation in 1953, with the head size reduced and the arches lowered by 25 mm to give it a more feminine appearance. The Imperial State Crown is 31.5 cm tall and weighs 1.06 kg and its purple velvet cap is trimmed with ermine. The frame is made of gold and platinum, and decorated with 2,868 diamonds,273 pearls,17 sapphires,11 emeralds, and 5 rubies. 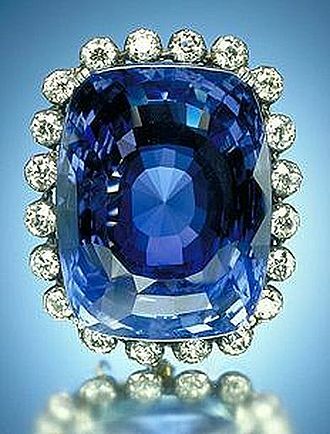 In 1909, the 104-carat Stuart Sapphire, set in the front of the crown, was moved to the back, three of the pearls belonged to Elizabeth I. The crown is worn by the monarch on leaving Westminster Abbey at the end of his or her coronation ceremony and it is worn at the annual State Opening of Parliament. Rutile is a mineral composed primarily of titanium dioxide, TiO2. Rutile is the most common form of TiO2. Three rarer polymorphs of TiO2 are known, Anatase, a metastable tetragonal mineral of pseudo-octahedral habit Brookite, an orthorhombic mineral TiO2, rutile has among the highest refractive indices at visible wavelengths of any known crystal, and exhibits a particularly large birefringence and high dispersion. Owing to these properties, it is useful for the manufacture of optical elements, especially polarization optics, for longer visible. Natural rutile may contain up to 10% iron and significant amounts of niobium and tantalum, rutile derives its name from the Latin rutilus, red, in reference to the deep red color observed in some specimens when viewed by transmitted light. Rutile is an accessory mineral in high-temperature and high-pressure metamorphic rocks. Thermodynamically, rutile is the most stable polymorph of TiO2 at all temperatures, the transformation of the metastable TiO2 polymorphs to rutile is irreversible. As it has the lowest molecular volume of the three polymorphs, it is generally the primary titanium bearing phase in most high-pressure metamorphic rocks. The occurrence of large specimen crystals is most common in pegmatites, rutile is found as an accessory mineral in some altered igneous rocks, and in certain gneisses and schists. In groups of acicular crystals it is frequently seen penetrating quartz as in the fléches damour from Graubünden, in 2005 the Republic of Sierra Leone in West Africa had a production capacity of 23% of the worlds annual rutile supply, which rose to approximately 30% in 2008. The reserves, lasting for about 19 years, are estimated at 259,000,000 metric tons, rutile has a body-centred tetragonal unit cell, with unit cell parameters a=b=4.584 Å, and c=2.953 Å. The titanium cations have a number of 6 meaning they are surrounded by an octahedron of 6 oxygen atoms. The oxygen anions have a number of 3 resulting in a trigonal planar co-ordination. Rutile shows a screw axis when its octahedra are viewed sequentially, rutile crystals are most commonly observed to exhibit a prsimatic or acicular growth habit with preferential orientation along their c-axis, the direction. Hardness is a measure of how resistant solid matter is to various kinds of permanent shape change when a compressive force is applied. Some materials are harder than others, Hardness is dependent on ductility, elastic stiffness, strain, toughness and viscosity. Common examples of matter are ceramics, certain metals, and superhard materials. There are three types of hardness measurements, scratch and rebound. Within each of these classes of measurement there are individual measurement scales, for practical reasons conversion tables are used to convert between one scale and another. Scratch hardness is the measure of how resistant a sample is to fracture or permanent plastic deformation due to friction from a sharp object, the principle is that an object made of a harder material will scratch an object made of a softer material. When testing coatings, scratch hardness refers to the necessary to cut through the film to the substrate. 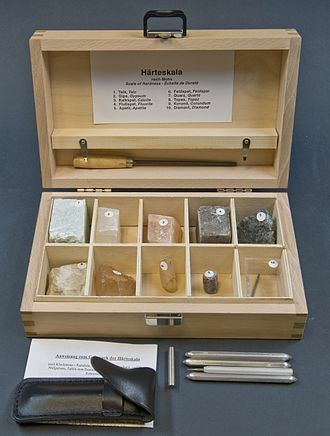 The most common test is Mohs scale, which is used in mineralogy, one tool to make this measurement is the sclerometer. Another tool used to make these tests is the pocket hardness tester and this tool consists of a scale arm with graduated markings attached to a four-wheeled carriage. A scratch tool with a rim is mounted at a predetermined angle to the testing surface. In order to use it a weight of mass is added to the scale arm at one of the graduated markings. The use of the weight and markings allows a known pressure to be applied without the need for complicated machinery. Indentation hardness measures the resistance of a sample to material deformation due to a constant compression load from an object, they are primarily used in engineering. The tests work on the premise of measuring the critical dimensions of an indentation left by a specifically dimensioned and loaded indenter. Common indentation hardness scales are Rockwell, Shore, rebound hardness, known as dynamic hardness, measures the height of the bounce of a diamond-tipped hammer dropped from a fixed height onto a material. This type of hardness is related to elasticity, the device used to take this measurement is known as a scleroscope. A ruby laser is a solid-state laser that uses a synthetic ruby crystal as its gain medium. The first working laser was a laser made by Theodore H. Ted Maiman at Hughes Research Laboratories on May 16,1960. Ruby lasers produce pulses of coherent visible light at a wavelength of 694.3 nm, typical ruby laser pulse lengths are on the order of a millisecond. A ruby laser most often consists of a rod that must be pumped with very high energy, usually from a flashtube. The rod is placed between two mirrors, forming an optical cavity, which oscillate the light produced by the rubys fluorescence. Ruby is one of the few solid state lasers that produce light in the range of the spectrum, lasing at 694.3 nanometers, in a deep red color. The ruby laser is a three level solid state laser, the active laser medium is a synthetic ruby rod that is energized through optical pumping, typically by a xenon flashtube. Ruby has very broad and powerful absorption bands in the spectrum, at 400 and 550 nm. This allows for high energy pumping, since the pulse duration can be much longer than with other materials. While ruby has a very wide absorption profile, its efficiency is much lower than other mediums. The finely polished ends of the rod were silvered, one end completely, the rod, with its reflective ends, acts as a Fabry–Pérot etalon. Modern lasers often use rods with antireflection coatings, or with the ends cut and this eliminates the reflections from the ends of the rod. External dielectric mirrors are used to form the optical cavity, curved mirrors are typically used to relax the alignment tolerances and to form a stable resonator, often compensating for thermal lensing of the rod. Ruby absorbs some of the light at its lasing wavelength, to overcome this absorption, the entire length of the rod needs to be pumped, leaving no shaded areas near the mountings. The active part of the ruby is the dopant, which consists of chromium ions suspended in a sapphire crystal. The dopant often comprises around 0. 05% of the crystal, depending on the concentration of the dopant, synthetic ruby usually comes in either pink or red. In crystallography, the hexagonal crystal family is one of the 6 crystal families. In the hexagonal family, the crystal is described by a right rhombic prism unit cell with two equal axes, an included angle of 120° and a height perpendicular to the two base axes. There are 52 space groups associated with it, which are exactly those whose Bravais lattice is either hexagonal or rhombohedral, the hexagonal crystal family consists of two lattice systems and rhombohedral. Each lattice system consists of one Bravais lattice, there are 3 lattice points per unit cell in total and the lattice is non-primitive. The Bravais lattices in the hexagonal crystal family can be described by rhombohedral axes, the unit cell is a rhombohedron. This is a cell with parameters a = b = c, α = β = γ ≠ 90°. In practice, the description is more commonly used because it is easier to deal with a coordinate system with two 90° angles. However, the axes are often shown in textbooks because this cell reveals 3m symmetry of crystal lattice. However, such a description is rarely used, the hexagonal crystal family consists of two crystal systems and hexagonal. A crystal system is a set of point groups in which the point groups themselves, the trigonal crystal system consists of the 5 point groups that have a single three-fold rotation axis. The crystal structures of alpha-quartz in the example are described by two of those 18 space groups associated with the hexagonal lattice system. The hexagonal crystal system consists of the seven point groups such that all their groups have the hexagonal lattice as underlying lattice. Graphite is an example of a crystal that crystallizes in the crystal system. Note that the atom in the center of the HCP unit cell in the hexagonal lattice system does not appear in the unit cell of the hexagonal lattice. It is part of the two atom motif associated with each point in the underlying lattice. The trigonal crystal system is the crystal system whose point groups have more than one lattice system associated with their space groups. Quartz mineral embedded in limestone (top right of the sample), easily identifiable by its hexagonal form. Pyrite sun (or dollar) in laminated shale matrix. Between tightly spaced layers of shale, the aggregate was forced to grow in a laterally compressed, radiating manner. Under normal conditions, pyrite would form cubes or pyritohedrons. Dichroic filters are created using optically transparent materials. Urate crystals, with the crystals' long axis seen as horizontal in this view being parallel to that of a red compensator filter. These appear as yellow, and are thereby of negative birefringence. 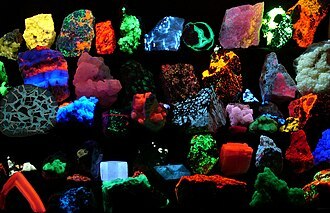 Fluorescent minerals emit visible light when exposed to ultraviolet light. Amethyst cluster from Magaliesburg, South Africa. 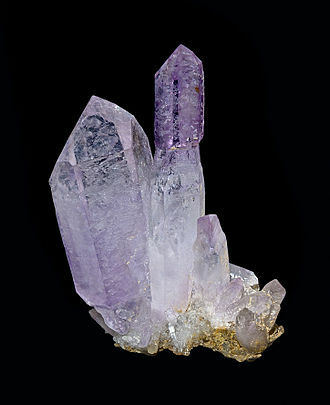 Amethyst crystals coated with hematite. An insect encased in amber, has gas bubbles protruding from its thorax and head. The term three phase relates to the three phases of matter, solid, liquid, and gas. This is a three phase inclusion in rock crystal quartz. The solid is a black material that is of bituminous origin. The liquid encased is petroleum, and the gas bubble is methane. Code Pink is an American women's activist group opposing war and globalization. 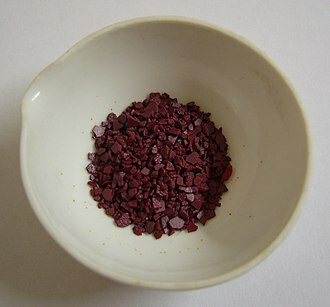 A sample showing the deep red color garnet can exhibit. Diagram of the first ruby laser. Total internal reflection can be seen at the air-water boundary. When minerals react, the products will sometimes assume the shape of the reagent; the product mineral is termed a pseudomorph of (or after) the reagent. Illustrated here is a pseudomorph of kaolinite after orthoclase. Here, the pseudomorph preserved the Carlsbad twinning common in orthoclase. A representation of the crystal lattice showing the planes of atoms. Planes of atoms split by an edge dislocation. The diamond crystal structure belongs to the face-centered cubic lattice, with a repeated two-atom pattern. Green fluorite with prominent cleavage. A compact fluorescent lamp seen through an Amici prism. In a dispersive prism, material dispersion (a wavelength-dependent refractive index) causes different colors to refract at different angles, splitting white light into a spectrum.